The high-fat, keto meals and keto snacks I ate in one day, from morning to night. 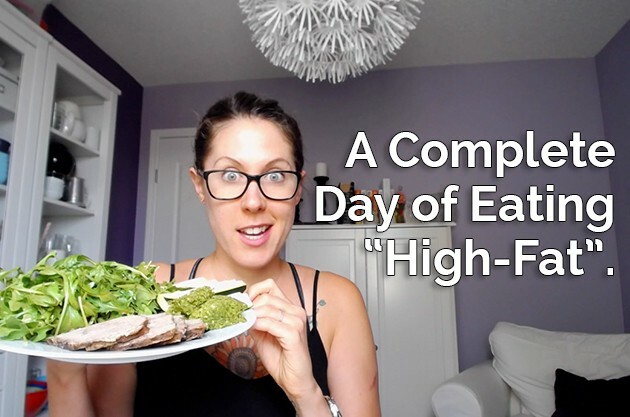 A day in the life of a whole food-based ketogenic eating style with a carb-up at night! You guys wanted to know what my carb-up night looks like… so, I set up my camera and recorded the keto meals and keto snacks I prepared for myself all day long. 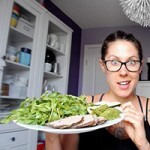 In this super-condensed video (with simple keto meal ideas), I explain what I’m eating, why I’m eating it, my mealtimes, and my experiences throughout the day so that you can see just how easy it is to be keto and Fat Fueled. Then, at the end of the day, I prepare a carb-up meal with dessert and explain the ins and outs of why I’m doing it and how it relates to healing. Hey, guys. I hope you’ve had a beautiful week so far. It’s Wednesday, yeah, hump day, and today I’m going to be sharing the keto meals that I’m eating, all day today. I’ve set up the camera. It’s ready to roll. Any time that I create anything that I’m about to eat, I’m going to run upstairs and take a video of it and share exactly why I’m eating it and the thought process behind it, and how I’m feeling, and all those things. The reason I’m making this video is because I’ve had so many questions since posting my “When to not intermittent fast” and “How do to a carb-up” videos. 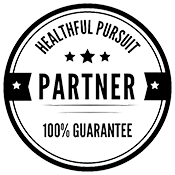 This is going to blend those two strategies together and really falls in line with the strategies from my newest keto book, Fat Fueled, so today I’m going to be sharing with you one of three profiles that allows you to become fat fueled with different profiles based on your preferences, your life, your stress levels, your healthy balances. If you want to get in on the pre-sale for my book, it’s still available. You can click up here to get on the pre-sale group or down below, and the pre-sale group gives you access to the book a little bit earlier than everyone else. You get a sweet discount, invitation to an online event in the next couple of weeks and a bunch of other goodies. This whole entire day is structured after the adapted fat burner profile. What I’m going to be doing all day today and what I normally do every day is I eat high fat, low carbohydrate, keto for breakfast and lunch, and then at dinner, I eat a regular meal, but I include carbohydrates. To give you a basis for where I’m at right now, I woke up about two hours ago. It’s currently 9:30 in the morning, and I woke up, sat in front of my sunlight lamp for a little bit because it’s really cloudy today and I knew I wouldn’t get much sun. To boost my mood and get me awake, and then I took the dogs for a walk, came home and prepared this quick. It took me literally two minutes to put together breakfast and I’ll eat that, and then I’m headed off to acupuncture and then I have a bunch of things to do for work and then I’ll come back and share my keto lunch with you. Today, my keto breakfast includes, you can see here, so the first thing on my keto plate right here is brisket. It’s just sliced brisket. I cooked this in my instant pot. I put salt and pepper on it, put it in my instant pot for about two hours with a little bit of chicken broth and just as it was starting to get a little bit peely, I broiled it on low broil for about fifteen minutes, so it got all crispy on the edges but not burned. Then here you’ll see some keto kale pâté. You can find the keto recipe down below and also right over there and any of the things that I mention, if there is a keto recipe, it will be in the notes section of the video and also below the video if you’re on my blog watching this. Then here are some zucchini sticks. Oh my gosh, if you haven’t just cut up raw zucchini and ate it with some keto kale pâté, you must. It’s so good, and then here is just arugula salad. I just took the whole container and added some dressing. It’s homemade dressing. It’s just olive oil and balsamic vinegar and salt and pepper and mustard. I just added that to the salad, mixed it around. If I were eating nuts, nuts would be great on here. [Han parts 00:03:22] would also be good, but I’m keeping it simple, because I’m going to acupuncture and I don’t want to be too full. That’s what I’m eating for my keto breakfast. I am going to go enjoy this keto meal and I will see you at lunchtime. It’s lunchtime. Like clockwork, five hours from when I had breakfast, I got a little bit hungry for lunch, so I started making lunch and this keto recipe is super-easy to put together. It’s on my blog. It’s a keto green coconut curry with chicken thighs, a little bit of spaghetti squash at the bottom and a ton of green cabbage and tomatoes, zucchini, and then I topped it off with my cilantro mint pâté which is loaded with fat, and then in order to cook it all, I cooked it in coconut milk and a bunch of coconut oil and then even drizzled some coconut oil on top as I was putting this warm bowl together. It’s quite cold today so I wanted something warm and nourishing for lunch. It’s likely that this will keep me full for about five hours or so, maybe six. I don’t know. When I get hungry, I’ll just eat. This is another low carb high fat keto meal. I don’t track my macros or anything like that anymore. By following keto for now over a year, I have a really good feeling of when I’m in ketosis, when I’m not in ketosis, when I’m in fat burning mode, when I’m not in fat burning mode. If I have a ton of energy in the morning, I know that I’m doing things correctly, and I woke up feeling refreshed and awesome today, so that’s a good indication that yesterday was great. Something I didn’t mention this morning, around 9:30. My last keto meal was at 7pm so I did have a little bit of fasting there, about fourteen hours but I didn’t have a keto rocket fuel latte or anything. I just went straight for breakfast. I’m going to go enjoy this amazing bowl of curry before it gets cold. If you want to check out the keto recipe, you can go to my blog here or down below. It has the keto pâté recipe as well as the keto coconut curry. It’s so good. I will see you at dinner time. Dinner. Before I show you my awesome keto plate, I will let you know what I’ve done today so you can put everything into context. After I had lunch, I kept working through the afternoon. I had about a twenty-minute nap, played with the dogs a little bit, then got back to work. Now it is 7:30 and I got hungry around 7:00, and made myself dinner and I’m dying to eat it so I will show it to you quickly. Again brisket, I’m having it for the second time today just because I made about two kilograms a couple of days ago and I just eat it all, slice it up as I feel. Sometimes I have three slices, sometimes I have five, whatever. I just keep it whole. Again I cooked it in my instant pot and you can see that it’s a little bit darker than it was this morning because I sautéed it in a little bit of suet, grass-fed suet, which is very similar to tallow, but it’s very saturated. This stuff gets hard so fast and I really like it a little bit crispy on the brisket. None of it is burned. I just cook it in a cast-iron pan for about a minute per side, and then here are some potatoes, and when I made the brisket, I cooked it with chicken broth and I reserved all that liquid and I’ve been cooking with it for the last couple of days. These potatoes were roasted in my cast-iron pan with a bunch of that broth and a little bit of the fat from the broth. I’m salivating. This smells so good. Then I topped it with some chives and a little bit of sea salt, well, a lot of sea salt as you can tell, and I could have cooked these potatoes in the oven but it would have taken a really long time and heat up my house. Potatoes are really high in Vitamin C so by cooking them in your cast-iron pan, you are pulling out the iron from that pan and it’s in the potatoes and your body can use it, and it’s balanced and it’s awesome. Now I have some carrots because I love combining the raw carrots with the brisket and then I made some basil pâté and you can find the keto recipe up here or down below. I just replaced the almonds with sesame seeds this time, and then I have a huge pile of romaine which I’ll probably mash in with the pâté, mix in some potatoes and get all down the business, so as you can see here, it’s like a normal size portion of carbs. I don’t overdo it because I’m eating carbs every night as part of a healing protocol for my adrenals. I talk more about that in my video about adrenal dysfunction, and you can find the link to that in the corner up there or also down below in the notes section. Or if you’re watching this video on healthfulpursuit.com, it’ll be right below this video. There’ll be a whole list of all of the things that I talked about, and so for me, since I’m having carbs every night, it’s a generous portion. I think there are two potatoes that I cut out like this. Sometimes it’s sweet potatoes, sometimes it’s yam, sometimes it’s green plantains or cassava roots. Speaking of cassava, I made brownies the other day and they are a base of cassava and if I get a little bit snacky later, I might have a brownie. Now after I’m done eating this glorious plate, I’m going to go downstairs and enjoy it with my husband. After we’re done eating dinner, we’ll probably go for a walk with the dogs. We usually do that after dinner every night just to catch up and see how each other’s day was and get out of the house and get some of the last bits of sun of the day, and then in the morning I’m right back to eating low carb, high fat, all morning long. I hope that all the meals that I’ve shared with you today and a little bit of the information and a layout of my day has been somewhat helpful for you. If you want to check out my other video on what I ate during intermittent fasting day, I’ve linked to it on the side here and also below. There’s so many links in today’s video. Intermittent fasting is a great tool and the reason I’m not doing it right now is because of my adrenals and I’m trying a different approach and trying more of a therapeutic thing for myself, but if you feel great with intermittent fasting and you don’t have any of the ten signs that I talked about in my previous videos, then yeah. Do it up. If you want to learn more about eating high fat, you can subscribe to my channel. I’ve included a link here. Go on and click that and you’ll get videos from me every Wednesday in your YouTube feed, and I hope you have a beautiful week. I will see you next Wednesday. Bye.